When focusing with any lens, what we tell the camera to do is to move an invisible mask back and forth along the visible area we can see through our viewfinder. This invisible mask can be short or long, or as Photographers refer to it, shallow or deep depth of field. When we move the focus ring on a lens with our finger, we tell that invisible area to move back and forth. Now, the wider our Aperture the shallower the depth of field. In other words the wider the Aperture the shorter the invisible mask that has things in focus. I have illustrated my thoughts below using some rough designs I made to help you understand the concept. In addition to the designs, I have shot some photos at different f stops (Aperture settings) so you can see the differences. I have made faint marks of the size of the invisible mask area so you can understand what happens each time. I have shot the photos on the carpet floor on purpose, so you can see the area that is sharp much easier. 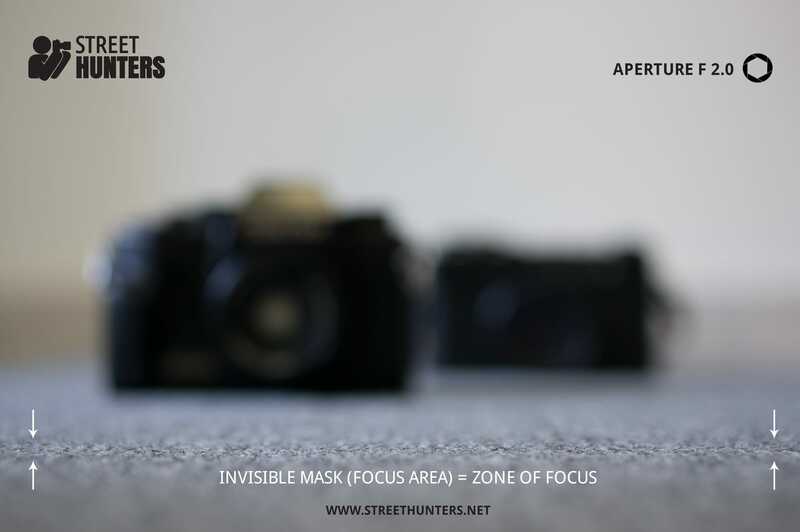 This invisible mask can be moved from close to far from our viewfinder, can become shorter or longer and can be easily controlled by us when out on the streets. Of course, the wider the Aperture the harder it is to control this with precision. It can be done with lots of practice, but most Street Hunters, like shooting at f 8.0 and above to get a longer invisible mask thus getting more things in focus at the same time. So, if you haven’t understood what Zone Focusing is by what I have mentioned until now, let me lay it out for you in plain English. Zone Focusing is when we adjust our camera to be in focus for a particular zone, or a particular size of invisible mask. This can be a short zone or a long zone. You can set it to be in focus for 2 meters starting from 1 meter away from you, you can set it to be in focus for 4 meters starting 2 meters away from you and so on and so forth. To know what will be in focus and how to set your zone, you need to know 3 things. Without these 3 things, you can not set your zone focus to a specific setting. If you are not familiar with all or some of those terms, please visit this awesome Photography glossary with illustrations by Tinyprints.com. You can read about all Photography terms there and enjoy some cool illustrations to help you understand everything better. I highly recommend you visiting this page. How do I set my Zone Focus? Knowing the above numbers let’s you estimate the zone focus size and distance very easily and vise versa, knowing what you want to set your zone focus too, can only be achieved by controlling these numbers. Of course, we live in an age where free online dof calculators exist and with those we can control our Zone Focusing very easily! One of the most well known ones is located at www.dofmaster.com. Using the Depth of Field Calculator or the Depth of Field Table any Street Photographer can estimate the depth of field to set their zone focus. There is a mobile site version as well for using it on the go! You will notice that the website hasn’t been updated for quite a while and the latest camera models, from 2013 onwards specifically, aren’t listed, but don’t worry. If you use a digital camera and you know your sensor size, just use a camera of the same make with the same sensor size to make your calculations. So, for example, if I owned a Fuji X-Pro1 I would just use the Fuji X-Pro1 sensor size from the calculator to estimate my depth of field. By setting my imaginary X-Pro1 to those settings I know now I can shoot anything within the zone of 1,47m and 3.14m and get it in focus. That gives me a zone that is 1.67m wide that starts 1.47m away from my lens. Everything in that zone is in focus. Check out the graphic I have made below to better understand this. Wouldn’t it be cool if we didn’t have to worry about zones when shooting in the streets? Wouldn’t it be cool if we could could just set a starting point and then have everything from there onwards in focus? That is possible and that is the Hyperfocal distance. Hyperfocal distance is a similar concept to that of zone focusing with one difference. Instead of setting a zone distance in which everything is in focus, hyperfocal distance lets you have everything in focus from one point and onwards to infinity! Let me share with you my personal definition of Hyperfocal distance. Hyperfocal distance is the focus distance that we set our lens too in order make our camera have everything in focus, from one starting point all the way up to infinity! The starting point of your Hyperfocal distance is affected by the same 3 things that you need to control when zone focusing. Without these 3 things, you can not set your Hyperfocal distance. If you are not familiar with all or some of those terms, please visit this awesome Photography glossary with illustrations by Treat.com. We get the same results as in the previous example, but now we need to focus on another number. That number is 5.45m and it is the Hyperfocal Distance. That means, that if we focus our camera at 5.45m specifically using the distance meter on the lens (if that is available) or the distance meter on the camera LCD or viewfinder screen (if that is available), we can set our imaginary Fuji X-Pro1 to have everything from 2.725m an onwards in focus, all the way to infinity! This is one of the Street Photographer’s mightiest weapons. 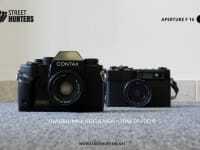 It is faster than any AF system in the world and it can be achieved on any old camera. As long as you know your numbers, you are fine! Quick Tip: How to set Zone focus or Hyperfocal without a lens with a distance indicator? Zone focusing and Hyperfocal distance are usually used when our lens doesn’t support Auto Focus, something like old manual lenses for example. Old manual glass, has distance indicators on it, making the zone focusing easy to set if you have calculated your numbers. But, what happens if you want to zone focus, using a modern AF lens that doesn’t have distance indicators on it? Some cameras like the Fuji X series cameras have distance information displayed in their OVFs and EVFs. So, all one has to do is to switch to manual and turn the focus ring until the correct distance is selected. There are cameras though that don’t have distance information. How do you overcome that hurdle? Well, quite easily actually. If you need to set your focus distance at 6 feet for example, all you have to do is put your back to a wall and walk 6 feet away. Then turn and focus on that wall and you are set. This isn’t an accurate way of zone focusing, but it works perfectly well, believe me I used to do this all the time with my SONY NEX-6 & SEL20F28 combo. Give it a go! No matter what camera you use, be it a film camera or a digital camera, if your system supports manual focusing you can always take advantage of the ease of use and speed of Zone focusing or the Hyperfocal distance. What are the benefits of Zone focusing and Hyperfocal distance? First of all you avoid any possible focus hunting that could happen using a Auto Focus camera system. Secondly because you skip the focusing part altogether, a zone focused or hyperfocal set camera, fires shots much more instantaneously than any AF system. Last but not least, you can take sharp photos while shooting the street at night using a flash! You just set your zone or your hyperfocal distance, activate your flash and then you just fire and forget! Everything in focus, even in pitch black! If you haven’t tried this before, next time you hit the streets give it a try. 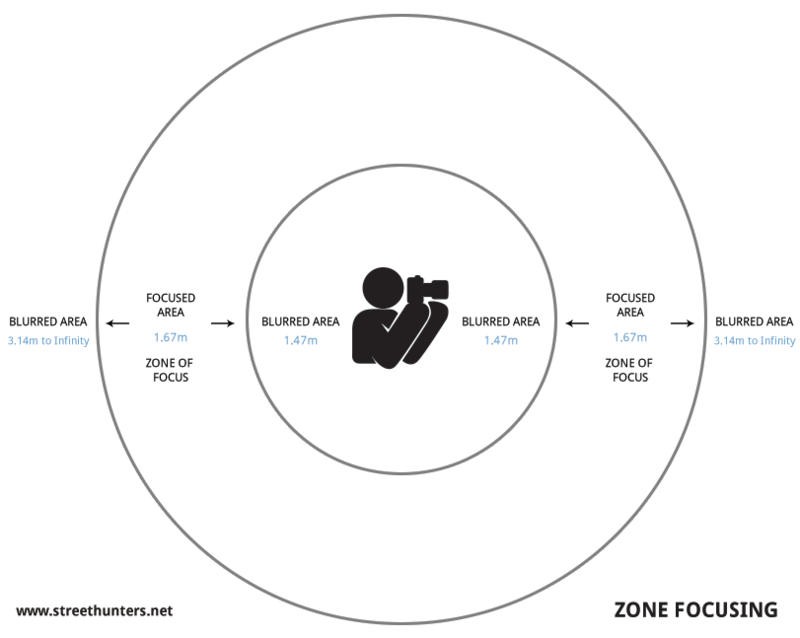 Below I have copy pasted all the useful links I referred to during my post for your convenience and also some links worth checking out to help you understand Zone focusing even better. Photography glossary with illustrations by Treat.com. I hate to be /that/ guy, but again, image format size has no direct influence on depth of field. On your article “A guide to buying the best camera for street photography”, three people, including myself, wrote about this. The influence that format size does have is incidental. The direct factors that contribute are: aperture, focal length and the distance between you, subject and background. Yeah, the rest of the article is great. I enjoyed it. Many thanks for this. I’d realised auto focus wasn’t doing me any favours shooting street and now I have a couple of approaches that should help speed up my shot time . I think it’s going to be of particular help in getting in closer for candid shots where the af limitations of my Fuji X-E1 become particularly apparent. Thanks also for the link to Treat.Com glossary, it can only help a self confessed photographic ignoramus such as myself. Thank you very much for taking the time to read the blog post. Yes, autofocus always has that split second of extra time in comparison to manual focus. It is only natural. Even the fastest AF system can’t beat no focusing at all 🙂 With Zone focusing that is exactly what you are doing. You set your camera to a certain distance and you don’t have to focus any more after that. You will notice that your camera will be much more responsive. I also find Zone focusing terribly helpful at night when shooting with a flash. The Treat.com glossary is very helpful, I agree. The guys at Treat.com shared it with us a week ago and we thought it would work great with this post. Just as a follow up — for anyone else using Fuji X series cameras there is an Android app DoF X-Mount that will do the relevant calculations. May well be a version or something similar for Apple or Blackberry users but you’ll need to check for yourselves as I don’t have a fruit flavoured phone. Spyros thanks for taking the time to produce such a useful guide – the graphics are very helpful too. I knew a bit about zone focusing, but when I’ve tried in the past I used the depth of field scale on the lens of my camera to approximate. I used a Pentax MV (aperture priority), set the aperture to f/8, the distance to something like 2.5m and knew that anything a couple of metres either side would be in focus (I forget the exat figures.) I was then freed up to focus purely on those two fundamental choices in photography – where to stand and when to press the shutter release button. It was very strange at first using an SLR in a way that was more point and shoot than a point and shoot! I got some decent results. Your guide shows us how to be a bit more specific with the figures, and once we do the calculations once, with one camera and lens combo, it’s pretty easy to remember to remember which aperture and focus distance to set it to, to ensure the consistently achieve the depth of field we want. It’s a good point too that this is a way that we can use manual focusing lenses in a very quick and effective way – I imagine many people new to (street) photography would associate them with constant adjustment and fiddling about, and instead use autofocus. Hello Dan and thank you very much for your comment. I appreciate you taking the time to read through the guide. I am happy that you found it useful and yes, I agree that with a one camera – one lens combo, after a few minutes on the street, you can get used to these methods pretty fast. I use them most of the time, especially when I am out shooting with my Yashica Electro 35 CC that has a 35mm lens. That focal length makes zone focusing and hyperfocal distance a breeze to configure. Spyros, I realised after writing about the SLR above, I’ve also been doing a similar thing with my old Cybershot compact, just not calling it zone focusing. I set it to Program mode, so you have a bit more control than fully auto, set the ISO to 400 which in decent light makes the camera most of the time choose f/7.1, and rather than use autofocus, use the preset focus, set to 1m, or 3m. Then all I need to do is compose and shoot. Much quicker, and I know the camera will capture a decent photograph of the scene instantaneously with a press of the shutter button, rather than half pressing to lock the autofocus, then fully pressing to capture. I remembered I also used to have a Konica Pop which had a fixed focus distance of 2.8m. Once I got an “eye” for that distance, it made the camera in many ways more enjoyable and instinctive to use then a camera with a focus range of say 1m to ∞. Again, I could turn my full attention to the composition right in front of me. Yes Dan. It seems that the simpler the user experience, the better the photographic experience. This could be an interesting point for a good blog post. Hey Rob, awsome post and very elucidating. I was left with one question: When you say everything from 2.7meters onwards will be in focus to infinity, this means that I need to be 2.7 meters from my subject (at least) for him to be in focus? Anything I shoot (with these settings) that is closer than that will be out of focus? As for your question. Yes, you have to be 2.7 meters at least from your subject for the specific settings I have used in my example. Anything you shoot that is closer, will not be in focus. Spryos, the Treat.com link is no longer valid. Please check and correct,/update if possible. Thanks. Perhaps you can also add more info on how you dothi this with your manual lenses used on your digital cameras so the beginners understand as i can see how it would still be unclear to than. Also if they have a new lens without markings they won’t be able to do this but that was not explained in the article. Hello Stephen! Thanks for bringing the broken link to our attention. We made a note explaining that the link is no longer valid. As for how to zone focus using a lens without markings, that is a great idea and indeed I should add that information in the post. I will make a note of it to make the addition next week. A quick tip as to how to do this would be to measure one’s distance in feet in front of a wall. So, one can go and stand with their back to a wall, count for example 6 feet which is about 2 meters and then turn around, focus on that wall and set adjustments accordingly. The link that was broken has now been re-established by Treat.com. It now exists on their new website at Tinyprints.com, so I have updated it if you wish to visit it. I would also like you to know that I added the Quick Tip you requested about how to set your focus distance with a lens without a distance indicator. Thanks for the idea! I’ve read lots of tutorials and watched a few videos too on this technique but I can safely say this is the easiest write up yet that I’ve come across on understanding what it all means and how to put it into action. I’ll be trying both techniques soon to see how I get on. I’ll probably practice in the garden or in the house first so I don’t waste valuable time or miss a shot while I’m out. A big thumbs up for this, cheers! Glad you enjoyed the post MisterGC and even happier that you found it easy to understand! the more I read about zone focussing the more confused I get…. What is the difference between the calculation method above and just using Manual Focus and setting it to a certain distance, say 2 metres? and then carry on using the TV mode or whatever I’m using at the time, without paying attention to aperture? Would the result be different from the calculation method? Yes it is totally different because one of the parameters that set the Zone is Aperture so if you have TV mode on and your aperture changes all the time you can’t possibly have a preset aperture, thus your zone focusing keeps on changing. So, in other words your zone focusing is cancelled the second you switch to TV. I know if I use TV mode, I cannot influence the aperture, but I never knew that the settings of manual focus change after I have set them – if the zone in focus is determined by aperture/focal length, I wonder what the point of the distance scale in the manual focus setting is…. I guess I will stick to autofocus then because I have never managed to take a good quality photo in AV mode yet. Hey my mistake. TV mode is shutter speed priority not aperture priority so your zone focusing should not change. If you are in aperture priority mode though your zone focusing will change. I think Iwill try this out when and if the weather gets better again….. Thank you for sharing that Kitty! Never tried street photography before but reading this i’m going to give it a go. I follow street hunters on youtube and love your video’s, keep up the good work. Hello Gary and thank you for your kind comment! I am really glad you find the videos interesting. I invite you to try Street Photography and please get back to me and tell me what the experience was like for you. I really appreciate your time on writing this article! Although I am no expert in both topics, I played around with the DoF calculator (thanks for this link!) and would like to add my views on this as an appendix to your article. Hyperfocal distance focusing can be seen as a special case of Zone Focusing where the far limit of acceptable focus is always infinity. Hyperfocal distance is the nearest distance which you can focus the lens at, for which the far limit of “acceptable” focus is infinity. It is only dependent on the aperture and focal length of the lens. eg for 6X4.5 film format, 60 mm lens and f/8, the Hyperfocal distance is 33 feet, near limit is 16.5 feet and far limit is of course infinity (note that sharpest focus is 33 feet) – all distances are measured from the lens. Hello Ashoke! Thank you so much for this additional valuable information. I am really glad you found the post useful and even happier that you contributed to it with such a valuable comment! Yes, the Fujifilm cameras have a distance indicator, but their in built calculator doesn’t work properly. For example in the X70, if you set Aperture to 11 and focal distance to 1.5m, the zone focus should be from 0.80m to infinity, but that isn’t what it shows. The only camera that I have found has a decent zone focusing indicator is the Ricoh GR. Depth of field indicators are bigger and easier to use on rangefinder camera lenses than slr lenses. It almost seems that using these scales is an important part of using the lens. I’ve used Nikon lenses on a Nikon F and the scales are short coloured lines to match the aperture settings. I did not find them easy to use. 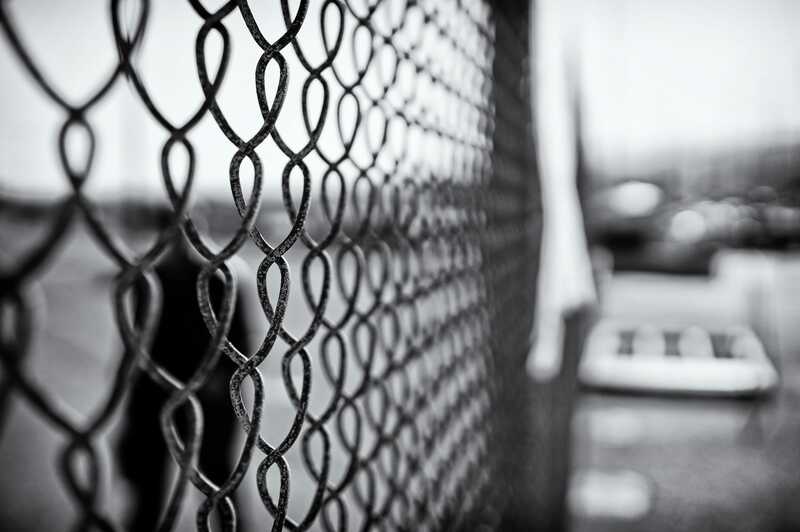 However, those on Leica M lenses like the 3.5cm f3.5 Summaron are very easy to see and use. I use this lens on a pair of Leica MDa bodies that are viewfinderless M4s. No need for a rangefinder as I use the hyperfocal distance method to focus. Framing is done by a 35mm viewfinder plugged into the accessory shoe. Two bodies enable me to swap finder and lens for the body cap of the second body. As both bodies have straps, I can shoot continually without having to reload. People are finding these Leicas to be very useful with wide lenses and accessory viewfinders. I’ve found them to be half the price of the M3/2/4 and in far better condition after previous use clipped to microscopes etc. They are MD (1964-67) MDa (1967-77) and MD2 (1977-86). The MD2 is black chrome and made in Canada. Thanks for your explanation! It certainly helped me a lot. I noticed at dofmaster.com that if we choose a determined lens (50mm for example) and a determined aperture (f/11 for exemple) the hyperfocal distance is always the same and doesn’t matter the distance of the subject. I tried it with all apertures stops and there is a hyperfocal distance for each one independent of the subject’s distance. Can we say that every aperture has it’s own hyperfocal distance and the distance of the subject doesn’t matter in this case? Hello Leonardo. I am glad you found the post useful. Concerning your question, since hyperfocal is a zone that extends to infinity it is directly related to the focus distance, but not the subject distance. So for example if I set my focus distance to 1.5m using 28mm lens and an aperture value of f11 and above, my subject can be anywhere between 1 meters to infinity and it will still be in focus. So, yes the subject distances is irrelevant, but the focus distance isn’t. When you find something you want to shoot, just press and hold the shutter while adjusting the focus and/or your body movement. So a camera that shows you every frame, has e-shutter and have great burst buffer is advantageous , such as thr nikon v1. I can select the most focused one in post processing. Hello Nick. Thank you for sharing your technique, however we have to make sure that the readers understand that what you are doing isn’t zone focusing, it is auto focusing with burst mode. For the line DOF calculator, how do we account for use with of old manual lenses on DX sensors? I use a 24mm manual Nikon lens on my D5200 which has a crop factor of 1.5, essentially making the lens a 36mm. In the calculator, I set the camera model as D5200, but for lens focal length, do I use 24mm (actual focal length) or 36mm (effective focal length)? I’m not sure whether the camera selection accounts for the fact that I’m using an FX lens rather than a DX lens. I assume it expects I am using a matched DX kit lens. What do you think? In theory, since you are using an old manual lens, so “full frame” on a cropped sensor, you should make your calculations taking into account the crop factor, thus estimating using the effective focal length. However I can’t be sure unless I actually try this out, but I don’t have any Nikon lenses or cameras any more. Thanks, Spyros. After doing more research, I learned that the crop factor only relates to the width and height (or angle) of what’s captured on the sensor (FoV). It does not affect DoF or HFD. So I would plug in 24mm into the online calculator rather than the effective focal length of 36mm. Cheers for the info Paul! 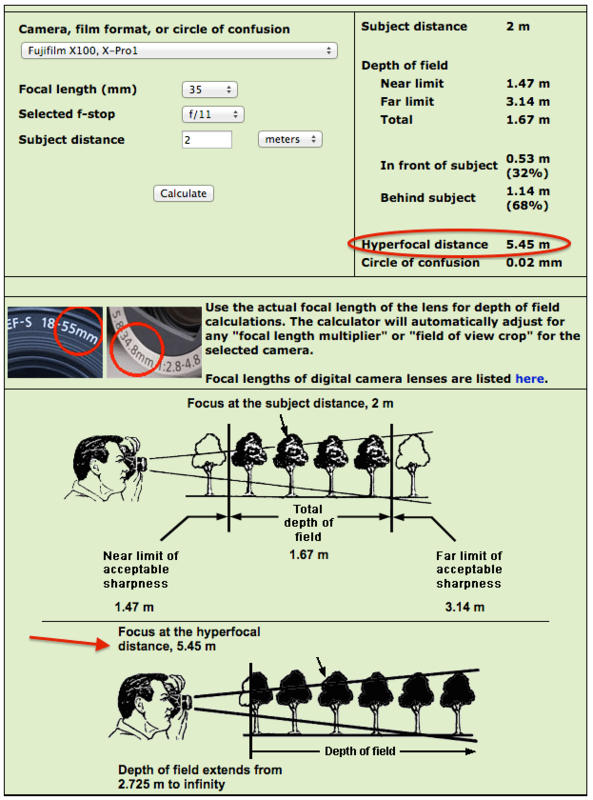 In the example you achieve Hyperfocal distance if you focus at 5.45m, not 2m. Basically the calculations show you that if you focus at 2m you get 1.47m to 3.14m but IF you want to Hyperfocal, then you should switch to 5.45m and then you will get everything in focus from 2.75m onwards.